It’s been a busy week with my friend from Alaska visiting but I managed to complete the head for our Chinese triplets. I will bisque fire it and then make a plaster mold of it. That way I can cast the triplets and they will be identical. I had to make the head without undercuts so it will pull out of the plaster mold. 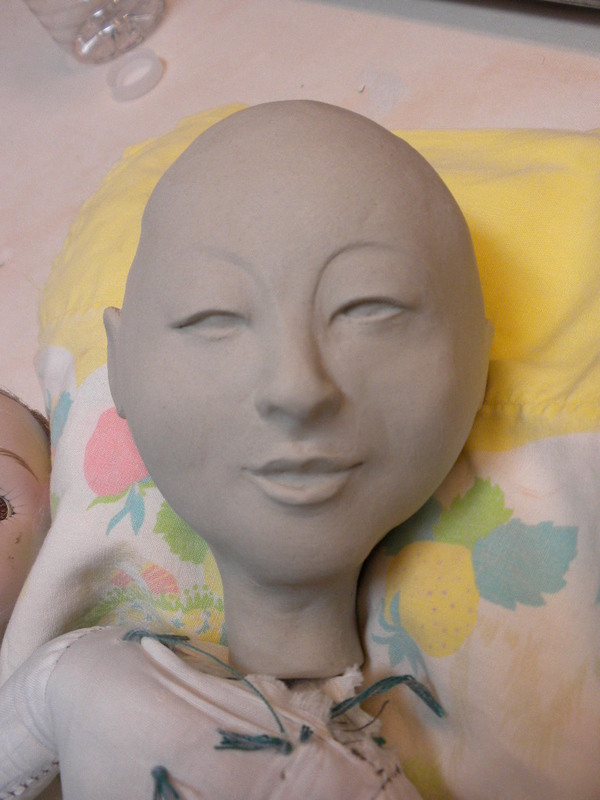 I can personalize each cast by adding in the teeth and detail in the ears and eyes. I’ll also probably add hair. As you can see from the top image, my plan for their bodies is to attach my heads to the doll bodies that Becky got off ebay. Then Becky can “dress” them in paint or whatever to fit them into an assemblage. After making the “Beauty in Her Boudoir” figure, I wanted to continue with the Asian theme. I asked myself “what does an Asian figure have to do with Becky and I?” Then it dawned on me that we both have Chinese nieces! She has triplets and an older sister that her husband’s brother adopted from China and I have my nephew’s newly-wed Chinese Hawaiian bride. So I’ve started what might become a series called “Our Chinese Relations”. 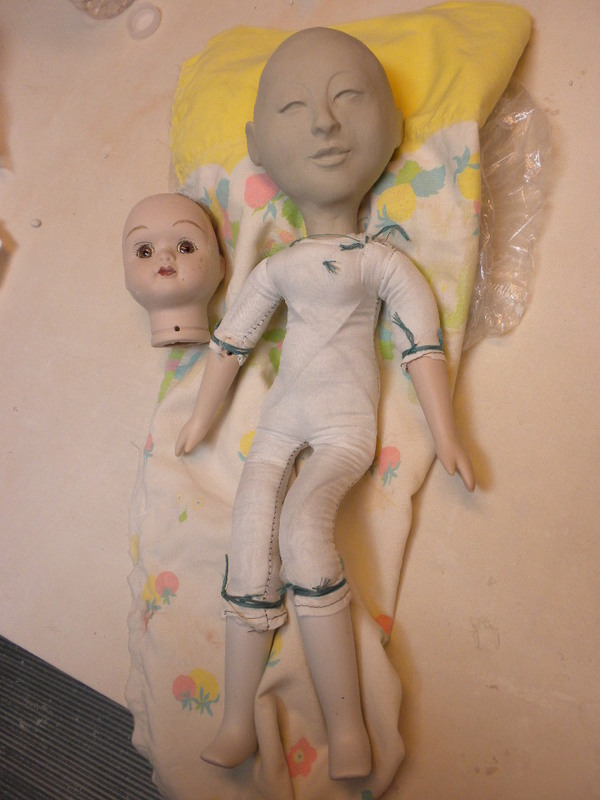 Can’t wait to see how they look with hair and the doll bodies! 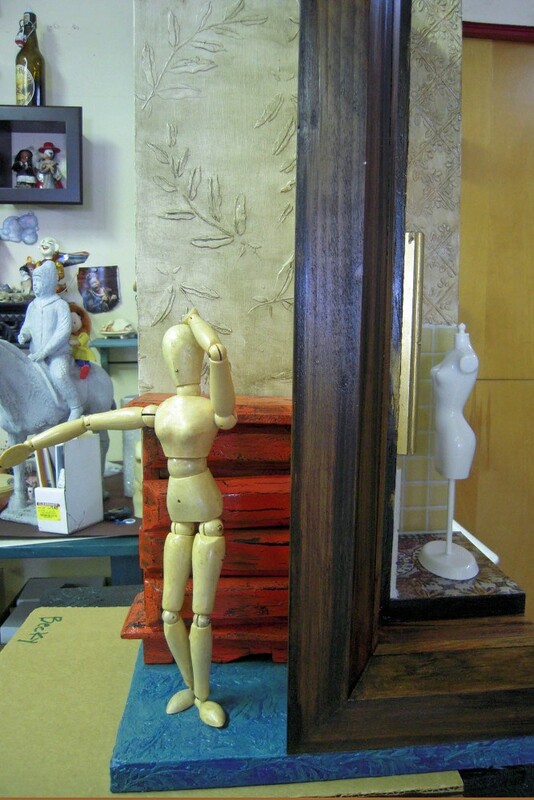 Interior constuction for “The Beauty’s Boudoir” with wooden drawing model standing in for ceramic figure in process. This is the first piece Becky and I started when I was in Tacoma. It has gone through several revisions which included a Chinese wooden doll posing in front of her mirror while her brother doll scaled the wall from the other side to have a peek. Now several months later, the dolls have been abandoned and I am making a ceramic figure reminiscent of Chinese Tang Dynasty court ladies to stand in front of the orange lacquered dresser in a state of dress or undress as the case may be…. Beginning stage of "My Inner Cowgirl"
One of the themes Becky and I are working with is “reinventing” ourselves. Every since I visited the Cowgirl Hall of Fame in Fort Worth, Texas, I have admired the early rodeo trick riders. They were such brave and talented women excelling in a male dominated sport. Becky and I carved these two pretty ponies our of laminated Styrofoam which she then surfaced with paper mache, gesso and paint. 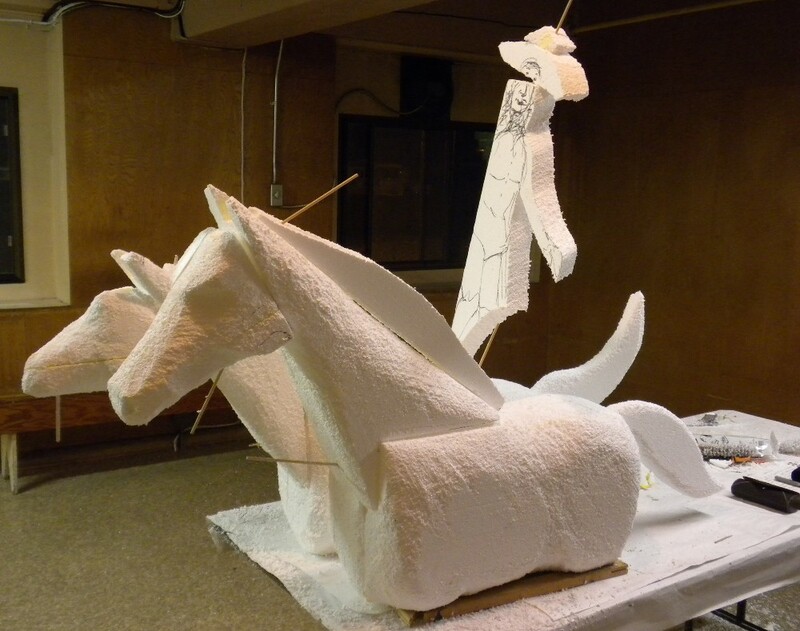 When the painting is complete and the wood legs are attached, I will make the cowgirl riding Roman style. 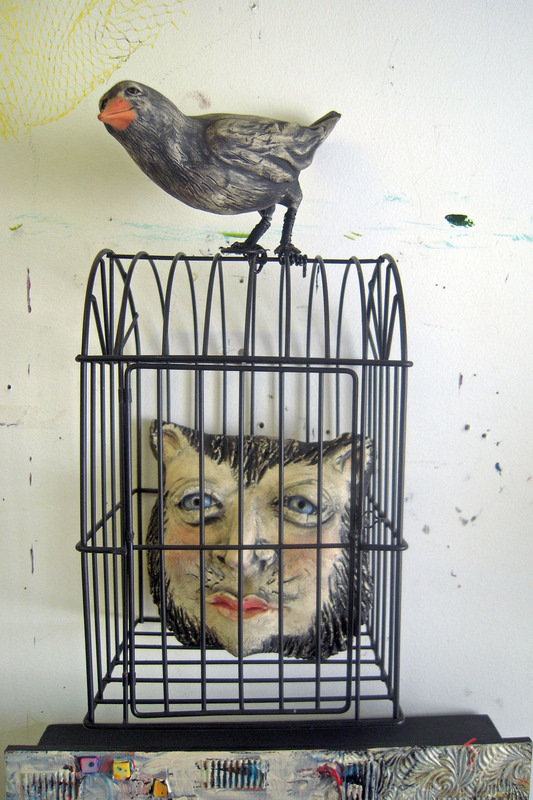 Becky attached the bird to the cage with the CatMan inside once Oslo (her dog) gave his approval. The bird has legs and feet now and is very upset that he had to fly to Tacoma in a dark and boring box instead of out in the open air on his own! 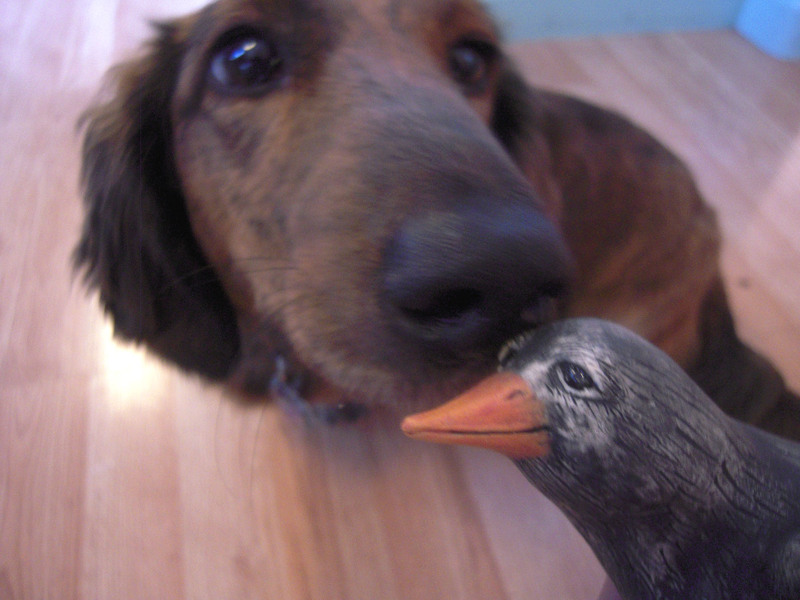 I shipped him via USPS Tues. 9/6. I packed him in a box the same size as the largest flat rate box which happens to be the same size that clay comes in. Because he is so light it only cost about $8. plus $2.85 insurance instead of the flat rate of $14. for the same size. So it is interesting to note that flat rate is a good deal if the package is heavy but other wise go with the regular rate. 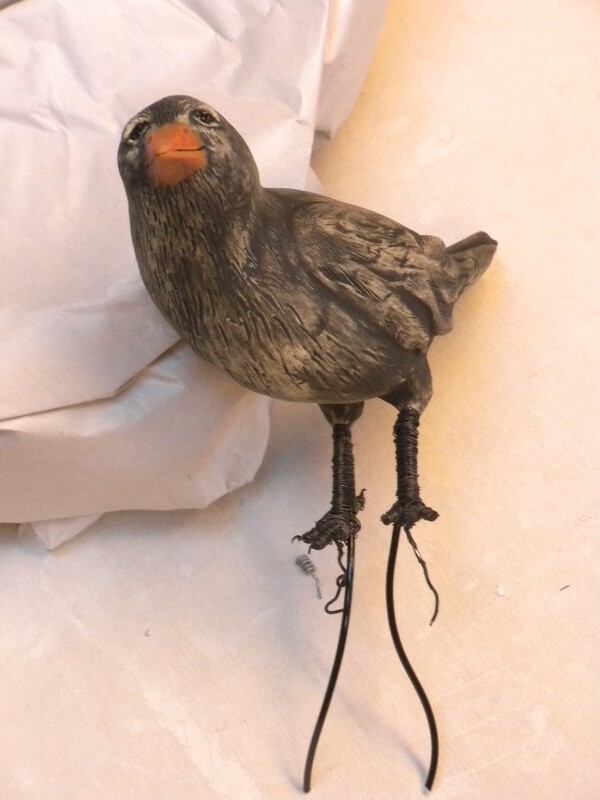 How I made the legs and feet: I cut out the legs from the little ornamental bird I brought home from your studio Becky. They are plastic around an inner wire. The top ends fit perfectly into the bird but they seemed a little too weak to hold up his weight and I wasn’t too keen on the plastic look of them. So I attached a piece of black aluminum wire to each leg by wrapping them in thin wire. The aluminum wire extends beyond the foot so you can use it to attach the bird to the cage. I like the look of the wrapped wire as it relates to the cage wire and the color of the bird nicely. 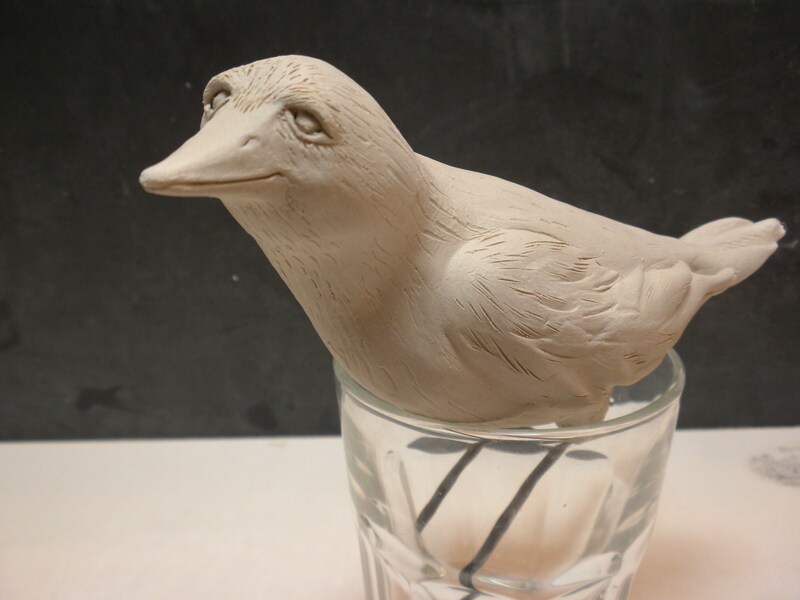 The legs are epoxied into the bird and they are a little flexible if you need to adjust them to fit properly onto the cage. Just be careful not to put too much pressure on the joint where it goes into the clay. You can trim the aluminum wire if its too long after you’ve attached it. The lighter wire from the plastic legs should help to stabilize his position some too. I’m anxious to see his landing! 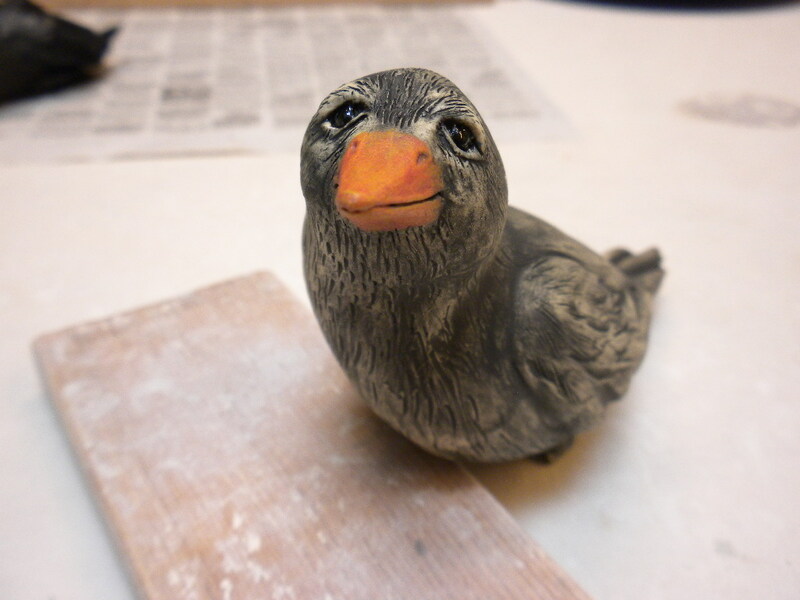 The bird is out of the glaze firing and patiently waiting for his legs and feet. how much studio time you will have.